NEW YORK, March 18, 2019 — (PRNewswire) — With a laser-like focus on innovation benefiting eyecare providers and consumers alike, the annual Vision Expo East will take place at the Javits Center in New York City, March 21-24. 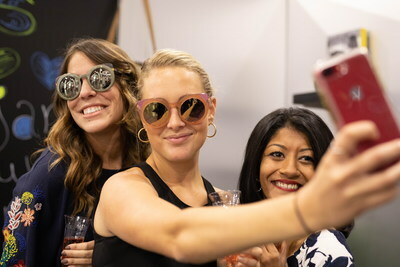 The definitive marketplace to discover fashion trends, witness new technology and access innovative products and services, Vision Expo East and its autumn counterpart, Vision Expo West, are co-hosted by The Vision Council. "Vision Expo is the premier event where the vision industry unveils the latest in eyewear and eyecare products, solutions and technologies to ultimately serve the greater purpose of providing better vision for better lives," said Ashley Mills, CEO of The Vision Council. "The Vision Council expects a strong Vision Expo East 2019 with several new exhibitors as well as an increase in attendance among buyers." Better vision starts with comprehensive annual eye exams. Vision impacts and can improve every aspect of life, from education, to performance, to safety, to employability. An eye doctor can identify and offer solutions to help people see, live and enjoy their lives. "More than 206 million adults in the United States use and require vision correction," said Mills. "The Vision Council and all of the companies who participate in Vision Expo urge all Americans to put their vision first." While there are 700-plus exhibitors on tap at the New York event, here is a taste of the noteworthy exhibits, products and activations at the show. In this era of digital convenience and tech wizardry, eyecare providers are embracing new and better ways to meet their patients' needs. 3D Printing – Luxexcel, a pioneer in 3D-printed lenses, has improved its proprietary technology for prescription lenses with the ability to create perfectly customized ophthalmic products and provide a prescription for "smart glasses." Completing the package, exhibitor Specsy offers an end-to-end system for frames that can be designed and printed in-store, customizing every element including the shape, color, bridge fit, temple length and base curve. VR/AR Fitting – Italy-born Thema brings its Virtual Eyewear Assistant Experience to Vision Expo East, helping consumers choose glasses best suited to their faces. With new online and in-store solutions, Fitting Box extends its pedigree as inventor of the first digital/augmented reality mirror to virtually try on glasses ABS Smart Mirror/ACEP TryLive showcases its in-store AR and VR solutions like Virtual Try-on, Lens Simulator, Digital Centration, Frame Advisor and interactive kiosks. Telehealth – Smart Vision Labs will exhibit its advanced mobile phone-based vision exam technology, a portable device adapted to a telemedicine platform to let patients obtain an eyewear prescription in minutes. Also making exams more accessible and affordable is 20/20 Now with its ocular telehealth system that lets licensed doctors perform thorough and highly accurate exam remotely. With eye health awareness central to the mission of The Vision Council, modern eyewear is being designed to better protect the eyes, whether from the overuse of digital devices or UV rays emitted from the sun. Clear Eyeglass Lenses with UV Protection – Zeiss comes to Vision Expo East with its all-day lenses incorporating UVProtect Technology, a first-to-market innovation offering the UV protection of premium sunglasses in an all-clear plastic lens. Transition Contact Lenses – Johnson & Johnson's Acuvue Oasys with Transitions Light Intelligent Technology are first-of-its-kind contact lenses with a dynamic photochromic filter that responds to changing indoor/outdoor light conditions, and were named one of Time's Best Inventions of 2018. TOMS Eyewear "Gift of Sight" – True to its pioneering One for One business model, for every purchase of TOMS Eyewear, the company provides a person in need with a complete eye exam and treatment, from glasses to surgery. Since the launch of the program, TOMS has helped restore sight to more than 600,000 people. ECO Eyewear's "One Frame-One Tree" – Since 2009, in partnership with the NGO Trees for the Future, ECO Eyewear has sponsored a tree for every frame sold, planting more than two million trees to date. Eschenbach Partner Project – In partnership with Fidelco Guide Dogs, Eschenbach has begun to sponsor the raising of future guide dogs. The company will have a guide dog at Vision Expo East and will hold a press conference Friday, March 22, to introduce its sponsored Fidelco German Shepherd guide dog puppy Magno. at its booth. Vitamin A Deficiency – Article One, a company based in Flint, Michigan, which produces handcrafted eyewear in Italy, was founded to raise awareness and funding for Vitamin A deficiency and blindness in developing nations. Sustainability – A variety of brands that craft eyewear from eco-friendly materials will be on display at the 2019 show, including Costa (specifically its Untangled collection), Marcolin's Timberland, MODO's ECO Eyewear and Shwood, among others. Vision Expo East takes place against the high-fashion, international backdrop of New York City, bringing fashion to the fore. No one embodies fashion more noticeably than celebrities, and this year's show will see the launch of celebrity-related products including Altair Eyewear's debut of a Draper James line by Reese Witherspoon, as well as EyeCandy's launch of a FUBU eyewear line. Vision Expo remains the premier event to see the latest high-fashion trends in eyeglasses and sunglasses, and new products will be on display this year from such top brands as Calvin Klein, Carolina Herrera, Chloe, Chopard, Diesel, Dior, Dolce & Gabbana, Emilio Pucci, Ermenegildo Zegna, Fendi, Furla, Gucci, Jimmy Choo, John Varvatos, Karl Lagerfeld, Lanvin, MCM, Miu Miu, Police, Prada, rag & bone, Ray-Ban, Rebecca Minkoff, Roberto Cavalli, Salvatore Ferragamo, Tom Ford and Versace, to name a few. Launched in 1986, Vision Expo unites the fashion, medical and business elements of vision care and eyewear to serve the entire community year-round. Vision Expo East, taking place at the Javits Center in New York City, from March 21-24, is complemented by the annual Vision Expo West, which will next be held at the at the Sands Expo in Las Vegas from September 18-21. For more information, please visit visionexpo.com.